Ashish Dhar, a Mechanical Engineer and an entrepreneur, lives in New Delhi. He is the co-founder of Pragyata, an e-learning portal dedicated to Indic knowledge systems. It was a bright, sunny day across the fertile plains of North India in the early winters of 2013. Narendra Modi was scheduled to address his first ever rally in the state of Jammu & Kashmir as the then PM candidate of the Bharatiya Janata Party (BJP). The rally was aptly named ‘Lalkaar’ given that Modi was seen as the beacon of hope for hundreds of millions of people in the country, looking for an end to the organized plunder of the nation’s resources by the UPA government. About two lakh people from different parts of the state had come to attend the mammoth rally and hear Narendra Modi speak. Around noon, Modi began his address. He spoke on a range of issues and took pains to call out the names of scores of big and small ethnic groups in the state, including the micro-minorities, demonstrating how he understood and personally related to their diverse sets of problems. Modi spoke for about 45 minutes, but not once did he bring up the name of Kashmiri Hindus. He had made a statement by omission. About a year later, Narendra Modi, now the Prime Minister of India, was closely following the politics of J&K as the assembly elections were just around the corner. His chief strategist, Amit Shah, also the president of the party, monitored the BJP’s state campaign in the hope of attaining more than half the seats in the state legislature to enable them to form the government independently. This was a pipe-dream and to give their ‘mission 44+’ rhetoric the credibility that it sorely lacked, they banked on the displaced Kashmiri Hindus to vote for them. When the inevitable results were out, Mr. Shah promptly placed the blame of BJP’s dismal, but totally predictable, performance in Kashmir on Kashmiri Hindus. Ironically, he failed to acknowledge that the same community had played a limited, but important, role in their decisive victory on the other side of the Banihal tunnel, with BJP getting an unprecedented 25 seats, all from Jammu. Eventually, after much political manipulation and endless negotiations with a hitherto sworn enemy, the BJP, for the first time, formed a coalition government with PDP in the state of Jammu & Kashmir. As there was considerable opposition to what some called an ‘unholy’ alliance, the party assured its voters that they were taking this course in order to get the proverbial foot inside the door of Kashmir’s volatile political ecosystem and also, to serve the people of Jammu, whom they couldn’t afford to let down. However, it turned out that their coalition dharma prevented them from making any progress whatsoever in terms of redefining the priorities of the state politics away from the longstanding Kashmir-centric obsession. The central government’s quest for resettling Kashmiri Hindus back in the valley is as old as the community’s exile. Successive governments have tried to do their bit, given that the inconvenient fact of the violent displacement of half a million people raises fundamental questions on the very claim that India makes over Kashmir. After all, if the state cannot guarantee its peaceful citizens in a particular territory the fundamental right to life, how can it claim control over it? Sadly, the government’s push for resettling the displaced community has been consistently misplaced and insincere. The very first chance of the reversal of what came to be euphemistically referred to as the ‘migration’ of Hindus was lost in 1990 itself when the government recalled Governor Jagmohan, the most competent and experienced administrator that the state ever had. By taking such a hasty and imprudent call, the government effectively shut out all possibilities of the timely return of the Hindus. In the years that followed, all our Prime Ministers, perhaps with the exception of PV Narasimha Rao, issued platitudes on the issue of return of Hindus and tried to engage in dialogue with groups such as Hurriyat, which comprised mostly of ex-terrorists, who by now were being called as ‘separatists’. Atal Bihari Vajpayee played a major role in this mainstreaming of separatism in the national political discourse and much to the dismay of Kashmiri Hindus, actively popularized erroneous notions about the nature of conflict in Kashmir. His irresponsible promotion of terms such as ‘Kashmiriyat’, advertised as syncretism unique to the valley but which is, in reality, another name for Kashmiri sub-nationalism, led to a drastic change in how ordinary Indians viewed the Kashmir conflict. In this way, the NDA government under Vajpayee successfully portrayed the religious conflict of Kashmir as a political problem that asked for political solutions. The UPA, on coming to power, worked out its policies in the new paradigm defined by the previous regime, and so began the new era of resettlement packages. As per the novel idea, the government announced economic incentives (roughly Rs. 7.5 lakh per family) for the displaced people that would help them return to their houses and repair them. But soon it dawned upon the experts who had come up with this idea that most of the houses did not belong to the original inhabitants anymore. Thus was born the idea of separate enclaves for Hindus. However, in all this ingenuity, the one question that remained unanswered was whether the conditions that had led to the exile in the first place had improved or deteriorated. Now, as the religious fundamentalism behind the violence was being denied, the government had the impunity to declare that the root causes of the Kashmir problem were being addressed by engaging in dialogue with the ‘separatists’. This rhetoric was further boosted by enticing some of the refugees living in dire poverty to shift to remote locations in the valley by providing them government jobs and then proclaiming success in the endeavour. As security of the returning population was no longer a consideration, it was made out to be that the Hindus were living happily in various parts of India and had no desire to go back. Thus the onus of return was transferred to Kashmiri Pandits. Further, a narrative was promoted that Kashmiri Hindus have no leadership with whom the government can engage in any dialogue. The fact was that none of the major organizations representing Kashmiri Hindus agreed to the government’s proposal of sending them back as scapegoats and therefore, the dialogue broke down even before it began. As they could not find leaders to talk with, the government ended up engaging with dealers – those who toed the government’s line in exchange of petty favours. Despite the greater public expectations from the BJP, their policy related to Kashmiri Hindus often turns out to be worse than that of the Congress. While the Congress is associated with blatant appeasement politics, the BJP’s agenda in Kashmir is unmistakably anti-Hindu, in that they appear keen to whitewash the cultural genocide of Kashmiri Hindus by raising phoney slogans of “Kashmiriyat, Jamhuriyat and Insaniyat”, all of which is wholly rejected by their Hurriyat poster boys. There are historical reasons for this dangerous perversion. Never in its history had the BJP played even a minor role in the politics of the Valley, owing to the uniquely skewed demographic equation in Kashmir. Just like the rest of the Indian society, the Sangh Parivar had little idea, because they had little experience, of the ground realities of Kashmiri politics, which has been heavily infused with the ideology of Muslim separatism since the earlier half of the twentieth century. In contrast, the Congress was part of the state politics right from the time of Kashmir’s accession to India and ruled the state for many years. Therefore, even though the Congress party can be held directly responsible for the rise of insurgency in the valley, it cannot be accused of ignorance. Regardless of the cynical nature of Congress brand politics, their national leadership had the right inputs from their state units, who had their ears placed on the ground. Not so with the BJP. As a consequence of the above, the leaders as well as the foot-soldiers of the RSS and BJP do not understand Kashmiri Hindu culture nor do they have an idea of the circumstances that led to half a million people getting uprooted from their home for millennia. At the same time, there is hardly any doubt that the Sangh Parivar has little affection for the most famous man among Kashmiri Hindus – Pandit Jawaharlal Nehru. Although Nehru was self-admittedly a Hindu by accident of birth and had nothing to do with Kashmiri culture, yet he was, all said and done, a Kashmiri Pandit. It is also true that many Kashmiri Pandits in the valley held Nehru and later, his daughter Indira, in high esteem owing to a pride emanating from primitive tribalism. But that’s that. However, Nehru’s antagonistic relationship with the Sangh Parivar has often resulted in a blanket prejudice against the ordinary Kashmiri Pandit, who is either stereotyped as the wily turncoat who betrays his own cause or a spineless snob who lacks the courage to defend himself. Like all stereotypes, these are reinforced by the selective recall of instances where Kashmiri Hindus have indeed acted that way. Sadly, the much talked about anti-intellectualism of the Sangh Parivar makes it impossible for them to look beyond these stereotypes. 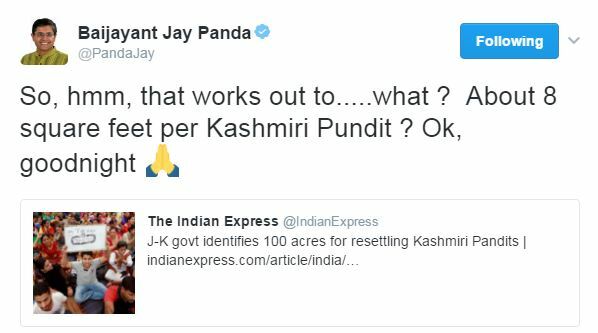 As explained above, the exodus of Hindus from the valley was a direct consequence of the rise of Jihadi terrorism in the late eighties. It had nothing to do with poverty, unemployment or an imagined alienation of the youth. There are numerous self-declared Hindu nationalists, often RSS members, who believe that the Hindus could have offered a resistance to the Jihadi violence instead of fleeing from the valley. It is futile to debate on such wild prescriptions offered by people whose understanding of the valley is often informed by ‘nationalist’ messages on WhatsApp but it is important to lay down a few facts for the readers to make their own minds. One, Hindus had been under siege in Kashmir not for a few years or decades but several centuries. Under such prolonged assault, survival and preservation of culture take precedence over guerilla warfare. Two, Hindus in the valley were overwhelmingly outnumbered by Muslims due to which the Hindus responded to daily harassment and mocking by tact rather than suicidal counter aggression. Three, the rise of jihad in Kashmir, just like anywhere else, was backed by foreign funds and the terrorists regularly crossed over to Pakistan to undergo ‘training’ in the act of waging war. Terrorism was thus a well-planned and well-funded rebellion against the Indian state. According to this report, 6274 security personnel have died in terrorist attacks since 1988. The question to ask is that if a supremely organized, well armed and highly skilled force as the Indian Army has suffered so many fatalities ever since it has been deployed in Kashmir, what chance of success would an unorganized civilian counterattack have? In all probability, it would have resulted in genocide like the one in Rwanda. Never mind the ‘Hindu nationalist’ jibes at the ‘escapism’ of Kashmiri Hindus, the reasons for their exile are absolutely clear. Therefore, for the government to say anything meaningful about the return of Kashmiri Hindus to the valley, it is imperative that they first take the root causes into cognizance and accordingly, devise their policies. In short, Hindus cannot coexist with a radicalized majority in the valley and therefore, the government essentially has two options: Either they carve out a Union Territory for the displaced people with the full flow of Indian constitution (minus article 370) or else, they make arrangements to settle the exiled community somewhere else in India. Nothing else makes any sense.